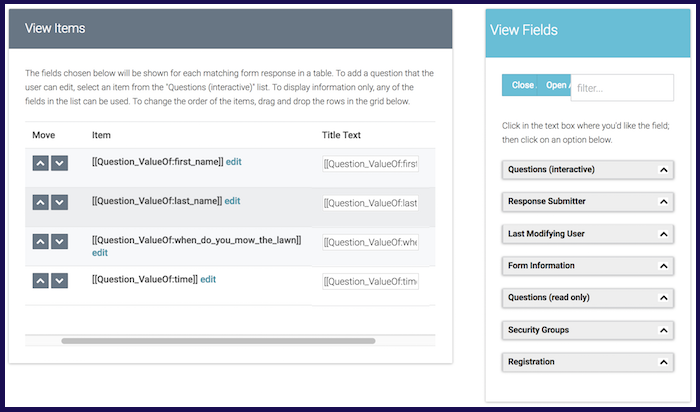 Text merge fields can be used to populate fields with answers/information collected by the form. This tutorial explains the purposes of text merge fields and walks you through the steps to effectively use them to customize your forms. Text merge fields are seen all around the FormBuilder application. This feature can be used to simplify a user's responses and customize your form with options that are consistent across all form responses, but unique for each form responder (e.g. a user's email address,net ID, etc...). When editing Form Contents, it may be appropriate to use Text Merge Options to add information about the form responder to the form. 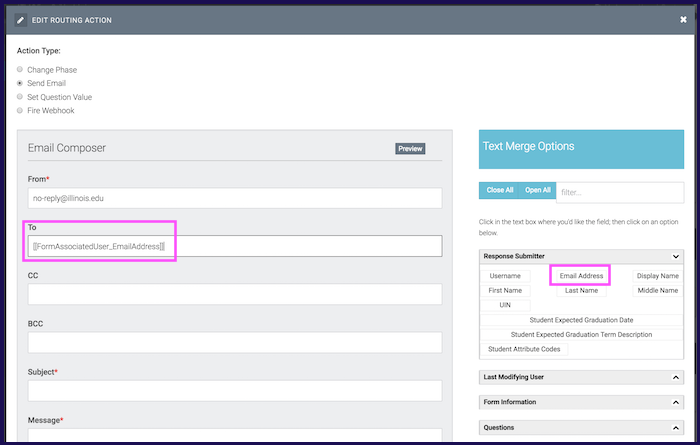 The process of using Text Merge Options to add a user's UIN is shown below. 1.) To open up the Text Merge menu in "Form Contents," go to insert a question and select the blue "Merge Fields" button (highlighted in orange box below). This will open the "Text Merge Options" menu on the right side of the screen. 2.) Click the drop-down bars to explore the options available. The example below shows how to insert the form responder's UIN into the default value of the bar (shown in pink), so that if a form responder is logged in before filling out the form, their UIN will automatically be entered into the field. How this question shows up on the final form is displayed below. This value will automatically be adjusted for the logged-in form responder. Routing actions are a useful tool when a form administrator wants to trigger emails to be sent out to form responders. Text Merge Options are an important factor in making this process simple to accomplish by creating a shortcut for collecting a response submitter's email. Once selecting the "To" field, click the "Email Address" button beneath the Response Submitter tab. The pink boxes below illustrate where these items are located. To learn more about adding routing actions to a routing trigger, check out ATLAS FormBuilder - Lifecycle - How to Build a Routing Trigger. 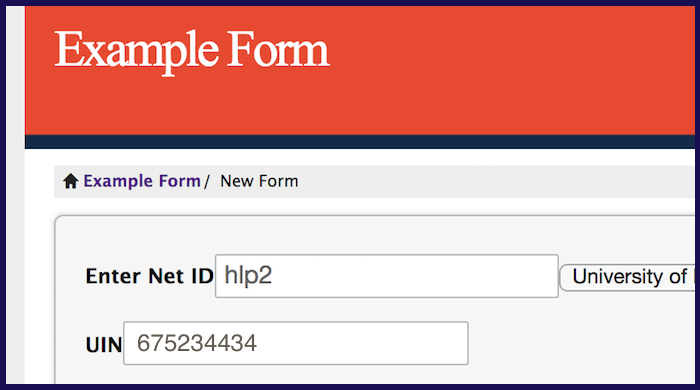 While a form may collect a large amount of information from form responders, aggregate form views allow form administrators to collect specific sets of data from those responses. 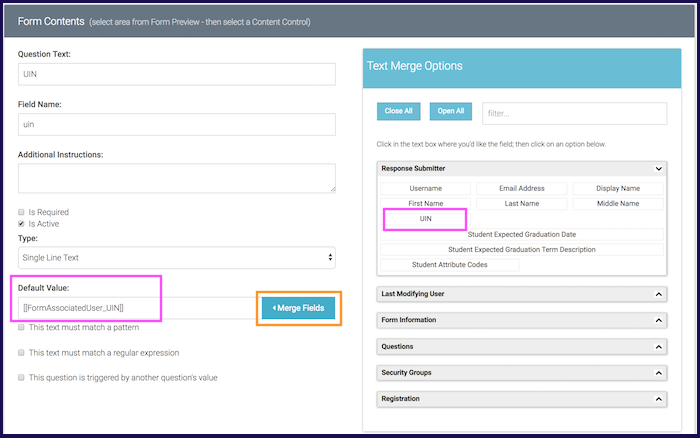 Text merge fields allow form administrators to insert the desired information directly into the data sets and allow for as many as needed. The example below includes name, date of mowing the lawn, and time of mowing the lawn. For more information on aggregate form views, check out ATLAS FormBuilder - Compiling data using aggregate Form Views.